These dogmas emerge out of and reinforce the very manner of offering Mass that had developed in the West well before the Council of Trent — in particular, the silent canon and the elevations. The silence and the elevations allow one to connect with and venerate the mysteries for their own sake, because they are worthy of all veneration, and our salvation is symbolized and summarized in them. In this way we are made to see an intrinsic purpose to assisting at Mass besides receiving communion: one is given the opportunity to join in the heavenly adoration of the Lamb, the elders and angels falling down before the throne, or the Magi falling down before the crib. Transubstantiation is the liturgical analogy of the Incarnation. It is a claiming of some corner of the material world for God’s Kingdom: as someone once put it, God is establishing a beachhead in enemy territory, or opening a passage for us by which we can ascend in spirit to the heavenly places. We long for the courts of the Lord and we ask Him to lead us there, as so many Postcommunions beseech. Whenever the Mass is celebrated more like a meal, versus populum, without silence, without serious elevations and double genuflections, with a memorial acclamation breaking in on our acts of adoring faith, and an overall informal ars celebrandi, such things undermine the aforementioned Tridentine dogmas and weaken the sensus fidelium. In such circumstances, it is not surprising that holy communion becomes the high point of the service, indeed the only point; and if one does not receive, one is “left out.” Why go to Mass otherwise? But if the focus is the priestly offering of the holy sacrifice as an act of the virtue of religion — giving to God, in justice, the right worship that is His due, which every human being owes to Him perpetually, regardless of his state or condition — then anyone and everyone has a profound, compelling, inescapable reason to go to Mass. In fact, Mass is the only way we can fulfill our debt to God of paying Him a worship with which He is perfectly pleased, and this even apart from whether or not we receive spiritual food in Holy Communion. Approaching the question from this vantage, we come to understand a hagiographical fact that may seem to us initially surprising, namely, the fact that so many saints assisted at Mass twice a day or even more than that, often without receiving communion. St. Thomas Aquinas celebrated a Mass at which his secretary Reginald served; they then switched places and Thomas served for Reginald. St. Louis the King “heard Mass” (as the saying was) twice a day. This behavior becomes perfectly understandable when we look at it from the perspective of the Tridentine dogmas. Since the Mass is a true and proper sacrifice infinitely pleasing to God in itself, to attend it and join one’s interior homage to that of the priest is a perfect exercise of the most excellent of all moral virtues, the virtue of religion, which honors God as the first Commandment bids us do; and since the Lord Jesus Christ is really, truly, substantially present under the forms of bread and wine, we are also brought into the very throne room of the King of Kings and Lord of Lords, to pay Him the homage of adoration He deserves and rewards. For these two reasons alone — that we may exercise the virtue of religion and that we may adore Our Lord with a privileged intimacy — assisting at Mass is the best thing a Catholic can do. Granted, one has to balance religious observances with one’s other duties in life, but if St. Thomas who wrote 50 folio volumes and St. Louis IX who ruled a kingdom and fought crusades could both find time for two Masses a day, we would be hard pressed to find a sufficient excuse for not assisting at one Mass a day (provided that a truly prayerful and reverent Mass is available, which, unfortunately, cannot be taken for granted nowadays). And all this, before we have even broached that most wondrous and most gracious of all the Lord’s condescensions to us, whereby He allows us, nay, invites us, if we are properly disposed, to approach with fear and trembling the altar of the “full, final sacrifice” and partake of the all-holy, life-giving mysteries of Christ, the very flesh and blood of God. In our own confused times above all, it seems vitally important not to get the inherent order of these elements mixed up, turned around, or otherwise confused. 1. The Mass is first the offering, through the sacrifice of Christ, of the religious worship we owe the triune God, for His own sake, because He is worthy of it and we are damaging ourselves if we do not rightly order our minds and hearts to Him. As St. Thomas says, God is offended by our sins not because they injure Him but because they injure the rational creature, whom He loves (that is, whose good He wills). This worship includes the acts associated with the offering of Mass, namely, adoration, contrition, supplication, thanksgiving, and praise, which have both internal and external aspects, as St. Thomas well develops in the Secunda Secundae of the Summa. 2. Second, because the Mass is the august sacrifice of Christ, we are brought into the very presence of the divine Redeemer, “the Lamb that was slain,” who is “worthy to receive power, and divinity, and wisdom, and strength, and honour, and glory, and benediction” (Rev 5:12). This is why Augustine says that before receiving, we must adore: we would sin if we did not adore. 3. Third, the Mass is the sacrificial banquet of the Lamb, in which we partake of His flesh and blood for our sanctification and salvation, provided we are not conscious of any unconfessed mortal sin, which includes living in a state of life that is not allowed by divine law. 4. As a distant fourth, one might then speak about the Mass as a social event in which the people of God are seen as a people, in which the unity of the Church is represented and accomplished, and in which certain of our needs as communal beings are met. But what we have seen in the past fifty years is precisely an inversion of these four, so that the Mass as social event is placed first; going up to receive Communion is placed second; the idea of adoration is a muted third; and the notion of the Mass as a propitiatory and impetratory sacrifice is so foreign as to be unintelligible. In light of this complete inversion, might we not consider anew Joseph Ratzinger’s provocative proposal of a “Eucharistic fast”: are there not times when, in order to avoid the subtle danger of taking the sacrament for granted or to be in solidarity with others, we might abstain, although we could receive? Should we not at times intensify our Eucharistic hunger and thus compel ourselves to overcome routine, distraction, and trivialization? This need not be construed as in tension with Pope St. Pius X’s encouragement of frequent communion, or, indeed, as in tension with the fact that the Holy Eucharist was instituted for our spiritual nourishment: “He who eats my flesh and drinks my blood abides in me, and I in him”; “Unless you eat of the flesh of the Son of Man and drink His blood, you shall not have life in you.” As a rule, those who are properly disposed ought to receive: thirsty men in a desert should drink the water provided for them. No doubt Ratzinger would concur. The overarching point we are arguing for is that there are several mysteries essentially connected with the Holy Sacrifice of the Mass, and that these, as defined with utmost clarity by the Council of Trent, ought to inform our understanding of the nature of the sacred liturgy and our participation in it. There is a nexus mysteriorum, a network of mysteries in which one illuminates and depends on another, in a certain order. 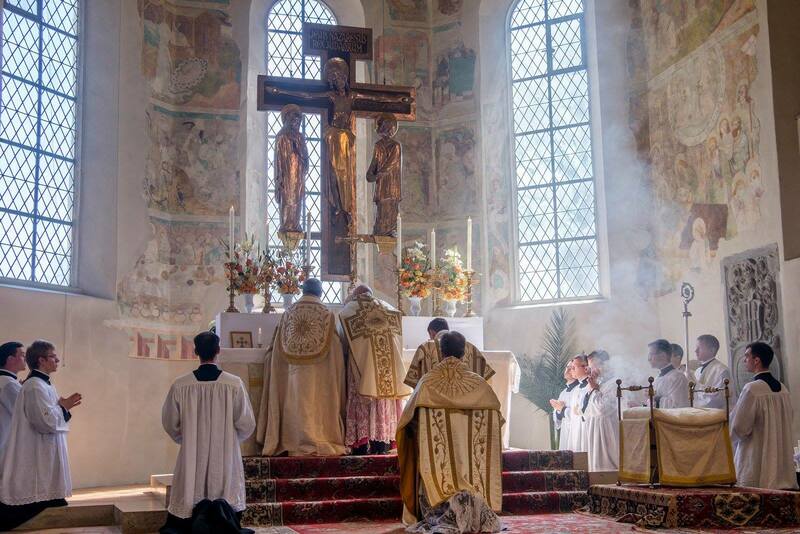 The form of the liturgy and the ars celebrandi of the celebrant will either faithfully reflect and amplify these mysteries, which will be to the benefit of the Christian people, or introduce misconceptions, distractions, barriers, and even errors in their regard, which will have a harmful effect on the Church militant as a whole. 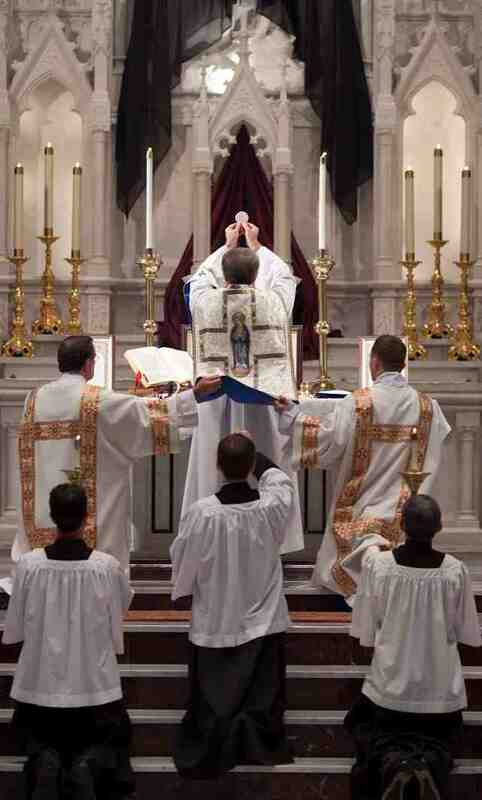 Thus it is false to say that the Mass is first of all a meal, or that it is a meal as much as it is a sacrifice. It is a sacrifice from which we are allowed to partake of the victim, just as there were sacrifices in the old covenant from whose flesh the priests could eat. A meal, in and of itself, is not a sacrifice, but a sacrifice can be a meal. This is why the Mass is not a reenactment of the Last Supper, as most Protestants (and too many uncatechized Catholics) believe, but rather a making-present of the oblation of the Son of God on the Cross on Good Friday. This is why it is not only misleading but heretical to emphasize the table of the Body and Blood of Christ as much as or more than the altar on which this victim is sacramentally sacrificed, and to celebrate the liturgy in such a way that the meal-character takes precedence over the oblation-character. It is for good reason that the Council of Trent, when defining the Mass, calls it repeatedly a sacrifice before speaking of its use by men as food and remedy. Enarr. in Ps. 98:9 (CCSL 39:1385). The Carthusian method for participating in Mass, shared recently at NLM by Gregory DiPippo, vividly exemplifies this nexus mysteriorum as it leads the worshiper through the various parts and prayers of Mass, and shows him how to unite himself to Christ in each one. This is to see the entire liturgy as an act of prolonged communion, even before one approaches the altar to receive the host.